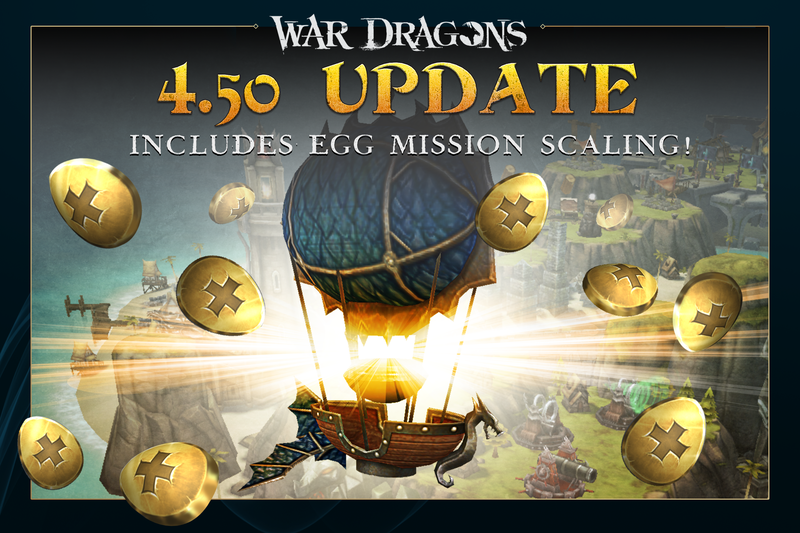 We recently announced that Egg Mission Scaling would be heading to War Dragons in one of our latest blog posts. Coming with the newest 4.50 update, this scaling feature will officially be available in-game! Read on for details about Egg Mission Scaling, as well as other notable updates coming with 4.50, including refreshed navigation for iOS players. What is Egg Mission Scaling? Egg Mission Scaling is a new feature that allows players to upgrade the Lookout Balloon as they acquire higher tier Dragons. How will this feature work in-game? 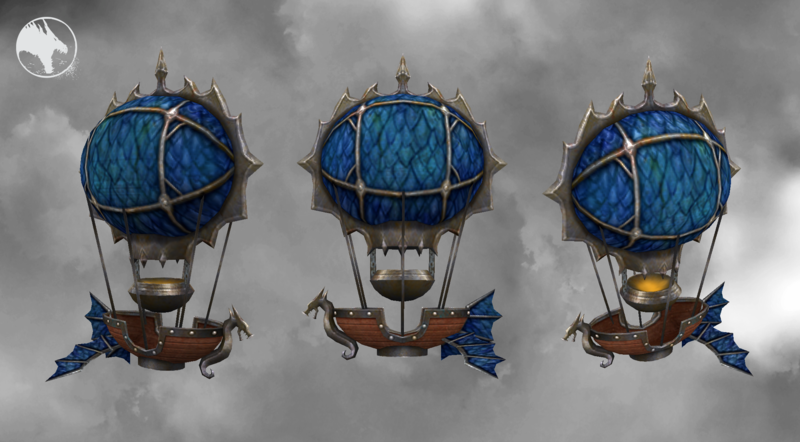 Players can upgrade the Lookout Balloon (similar to other economic buildings) by spending an egg of the next Dragon Tier. Each tier grants 5% of the base reward of breeding tokens. As a player’s Balloon tier increases, higher base Breeding Tokens will be awarded for each of the three daily missions. How do I upgrade my Lookout Balloon? Improving the Lookout Balloon is done similar to other economic buildings using an Upgrade button. It will cost an egg of the Dragon Tier that is one Tier beyond a player’s current Balloon. Players can obtain extra eggs through the Breeding Castle, similar to those used to Research. For example: To upgrade a Purple Lookout Balloon to a Blue Balloon, it would cost 1 Blue Dragon egg. Do I have to wait any build time for the Lookout Balloon to upgrade? Nope! Upgrades to the Lookout Balloon will be instantaneous once triggered. How far can I upgrade my Balloon? There is a Balloon tier available corresponding to each Dragon Tier in the game (currently Red through Vanguard). Players are limited only by the Tier of Dragon eggs they’re able to acquire. What will the introduction of Egg Mission Scaling mean for expediting egg missions with Rubies? The number of Rubies per Breeding Token needed to expedite missions will remain constant as the Lookout Balloon increases in Tier. This means that as the Balloon provides missions with more valuable rewards, the cost to expedite these missions will increase in parallel. How will this feature work with Season Bonuses and Elite Bonuses? Great news! Egg Scaling affects the base value of missions, which is subsequently multiplied by any other bonuses, including Elite Account, Seasonal Egg Branch, and Breeding Events. How will I know what level my Egg Balloon is currently? The Lookout Balloon floating next to your base will display different colors based on its current Tier. A Blue Tier Balloon will be blue in color, Green Tier will display green, and so on. When viewing Egg Missions, the title bar will also display the current Tier color of the Balloon. Will Egg Mission Scaling be available to everyone once the 4.50 update is released? Yes! Egg Mission Scaling will be available to all players once they’ve updated the game to 4.50. Egg Token Mission Scaling will be available with the latest 4.50 update to Dragons. Read on below for some of the most notable additions coming with this update! The 4.50 release also brings the new Dragons navigation to all players on iOS devices! The release is joined by improvements to updated screens based on Android player feedback from both our feedback Forums thread and in-game survey. For more information on the iOS Navigation Update, including a list of improvements to the navigation based on player feedback, visit our latest post on the Dragons Forums. Everyone’s favorite Mythic Sorcerer from the Springveil Season is getting an important update in 4.50! There is a known issue in the live game where the freeze effect of Corthanak’s Ghostfire Blast spell was unintentionally persisting permanently on affected towers when cast twice in a row, thereby providing too much effectiveness. We’ve now fixed this issue with Ghostfire Blast, and will be rolling it out with the 4.50 release. A live issue in-game around Balahm’s Ferocious Shield spell has been fixed as of 4.50. Previously, Balahm’s spell was not blocking Mage supershots as intended. Please upgrade to 4.50 in order for this spell to be fixed! Teams in Atlas can now surrender ownership of castles to a team in their alliance! Building levels and Castle Guards will be penalized in the same way as when a castle’s Upkeep expires when the transfer occurs, but the upkeep timer will not change from before the castle was transferred. Role-holders, like the Governor and Marshal, will be unassigned, and RSS will be forfeit, so make sure to transfer everything out of the castle before surrendering ownership! For a detailed list of all changes in the 4.50 update, check out the 4.50 Patch Notes on the War Dragons Forums. What are your thoughts on the new Egg Mission Scaling? Head over to the War Dragons Forums to get the conversation started!